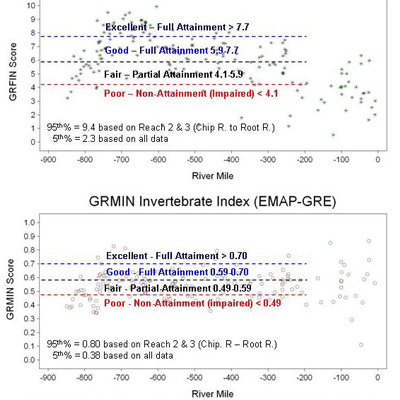 1) examining alternate approaches to establishing thresholds using the EMAP-GRE indices beyond the three condition classes developed by GRE; 2) comparing GRE-based thresholds to those developed using alternate approaches and indices, including a reference condition-based approach; 3) further exploration of the sensitivity of the GRE suite of indices and other available indices to a set of stressor gradients; and, 4) evaluating the inclusion of a submersed vegetation index into a UMR bioassessment. 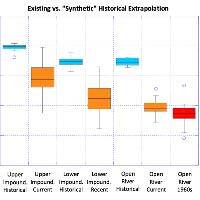 Various statistical methods were used to derive CWA thresholds for the indices examined and the appropriateness of those thresholds in light of aquatic life use attainment realities in the UMR main channel. As such this report produce a first time assessment of the UMR main channel utilizing biological data as the arbiter of CWA goal attainment.